Marlin said it was a traditional Southern dish meant to bring good luck for the coming year. I had never heard of it, but I’m a believer now, and I have made it every year since. I’ve made a few changes of the Italian sort to the vinaigrette. This is so good. I promise! 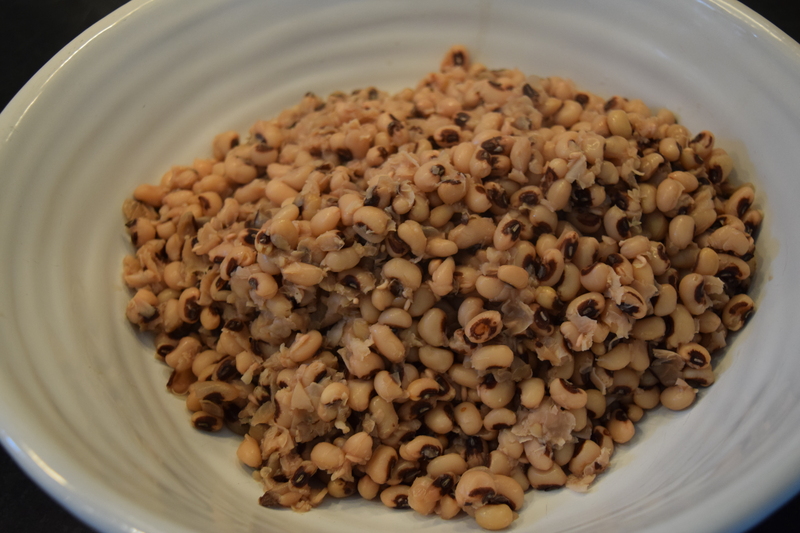 Before you cook dried peas, you need to soften them using either the overnight soak method or the quick soak method. I usually decide which method to use based on how much time I have to prepare the recipe. Either way, the first thing you need to do is rinse and inspect the peas to look for small stones. I happened to find a tooth-breaking pebble in this batch! 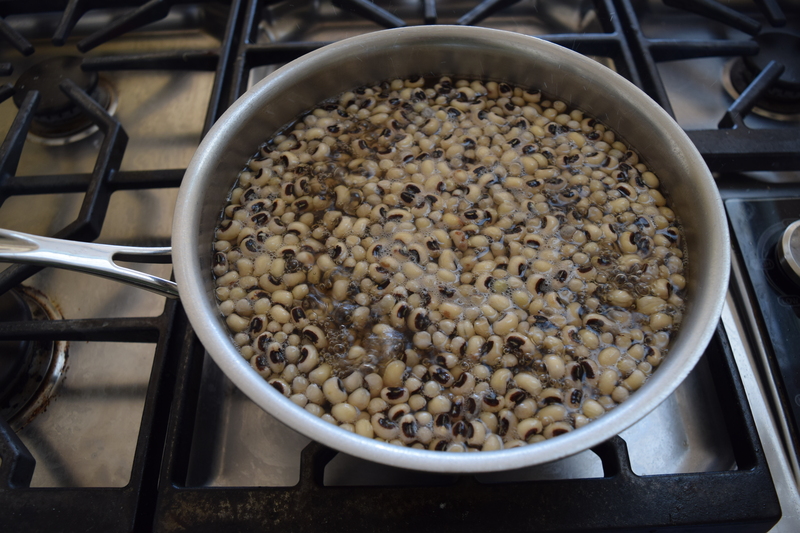 1) The Overnight Soak Method: put the washed peas in a pot, cover with 8 cups of cold water and soak overnight for 6-8 hours. The peas expand to about three times their size while soaking. Drain and rinse in a colander. 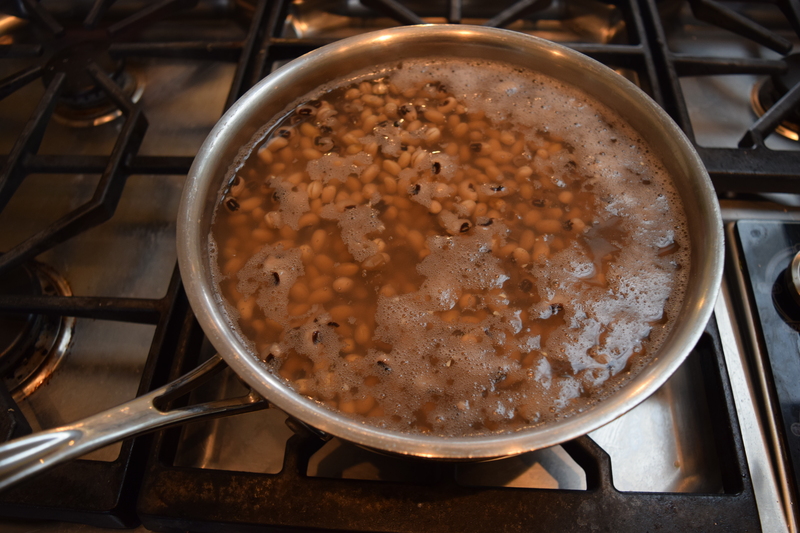 2) The Quick Soak Method: Fill a pot with washed beans, add 8 cups of hot water, bring to a boil for two minutes. Cover, turn off heat and soak for one hour. Drain and rinse in a colander. 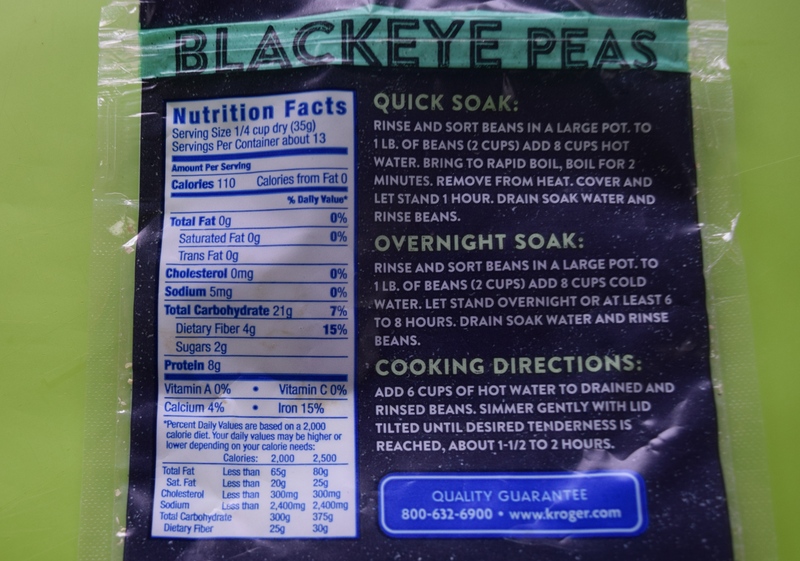 You will find soaking instructions on the backside of most bags of dried peas and beans. Put the softened peas in a pot and add 8 cups of water. Do not salt the water. Bring to a boil and simmer for about an hour. Set your timer. Peas are done when they are tender to eat. If they start to break apart, they are overdone, but still usable (the final product will be more hummus-like, and that tastes good, too). When done, drain in a colander. While beans are simmering, make the salad dressing and prep the add-in vegetables. You will want to add the salad dressing while the peas are still warm. Measure 1/2 cup of olive oil in a liquid measure. To this add the cider and balsamic vinegars, salt, pepper, oregano, mustard, and garlic. Whisk together and set aside. Wash and seed peppers. I used half of each color of pepper which when chopped came out to about 1½ cups total. I use different colors because I like the confetti look. I used half an onion that came out to about ¾ of a cup. Later, I added two green onions for more flavor and color. To prep peppers and onions for chopping in a food processor, cut into two to three-inch chunks. Pulse until minced. Do not purée. 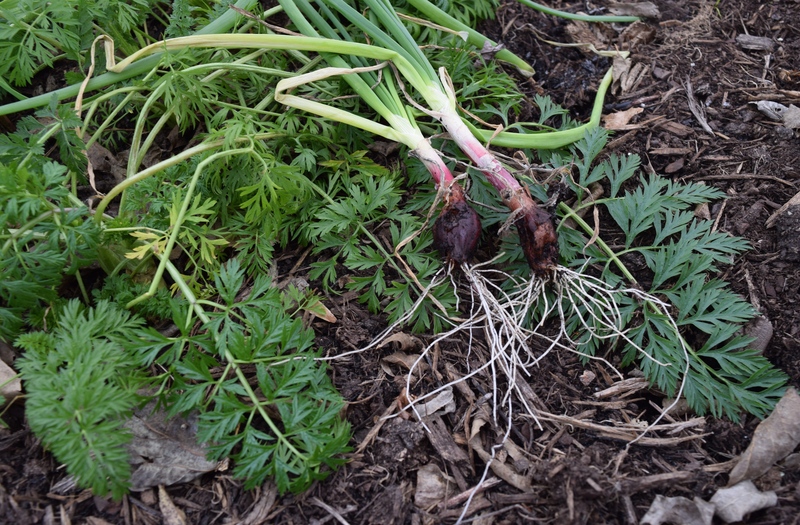 When I went to look in my garden for more parsley for the garnish, I noticed the green onions were still flourishing and added two of them to the salad. 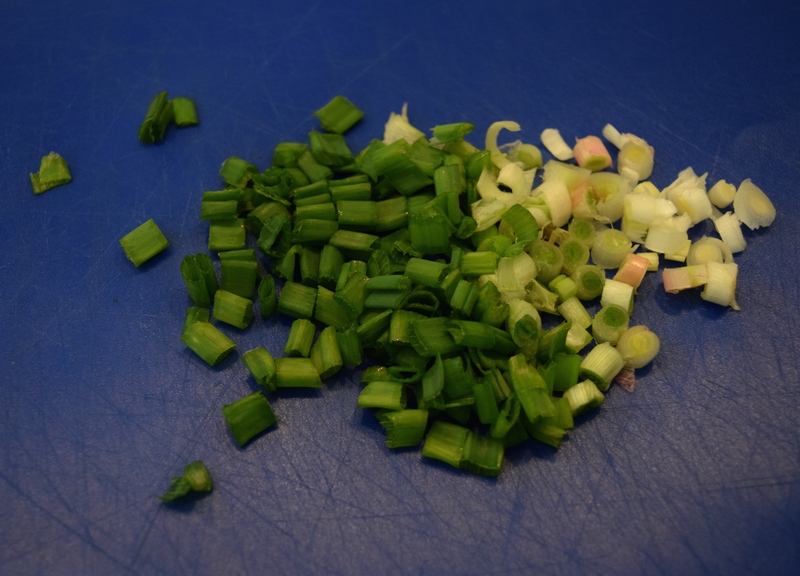 Notice how I used both the white and green parts of the green onions or scallions, as we called them up North. Place the cooked, drained, and still warm peas in a mixing bowl. Add the salad dressing and the chopped vegetables. Mix well and refrigerate overnight. Toss once or twice while in the refrigerator. Serve chilled. That recipe looks wonderful. Happy New Year, Judy! Laura, so glad we were able to come up with a date for your Grapevine Garden Club’s Kitchen Gardening 101 class. Looking forward to it! This would be a great summer dish. 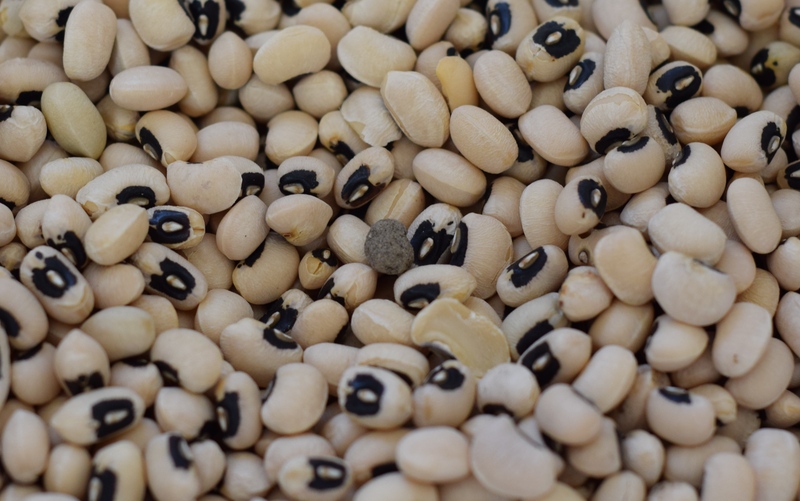 Howell’s market stand sells fresh black eyed peas. Judy I’m going to make this. 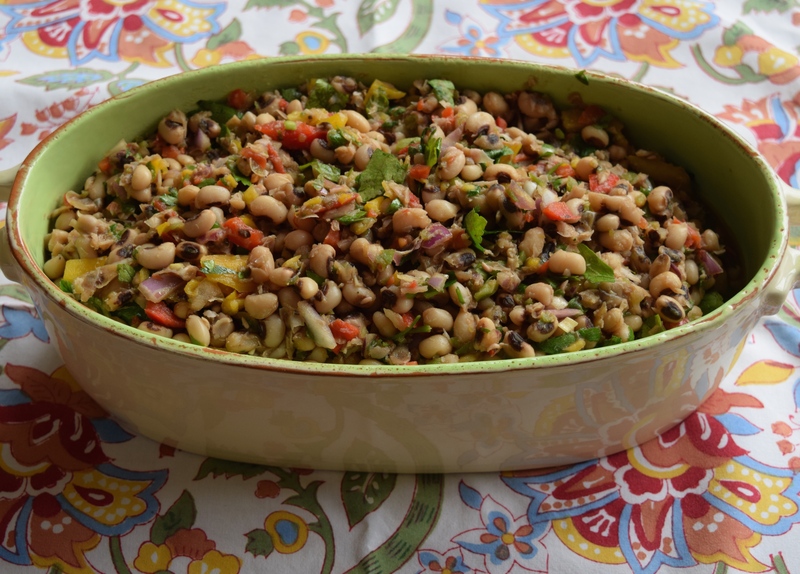 Cathy, this IS a great summer dish! I’m making it this morning to bring to the lake for the weekend. I went to Howell’s after I read your note and they were already sold out! Were you able to get some? I bought some fresh lima beans from them. Have a great weekend and congrats on your debut on The Volunteer Gardener!